We’ve been dreaming of this day since we moved into our home 5 years ago. Our bathroom was the very last project we completed and it feels amazing to be done! While we have been anxiously waiting and saving to tackle this space for years, we’ve been putting plans in motion since last October and demo started April 1st! • Before photos and demo begins! And one more, looking into the closet so you can see how it was laid out before (I’ll never miss that water closet in the middle of the whole room), although we’ll save the closet reveal for a different day. We have a few more things to finish up there first. The biggest change to the vanity area has been the floating vanity we designed and had made through Fashion Cabinets in West Jordan, UT. 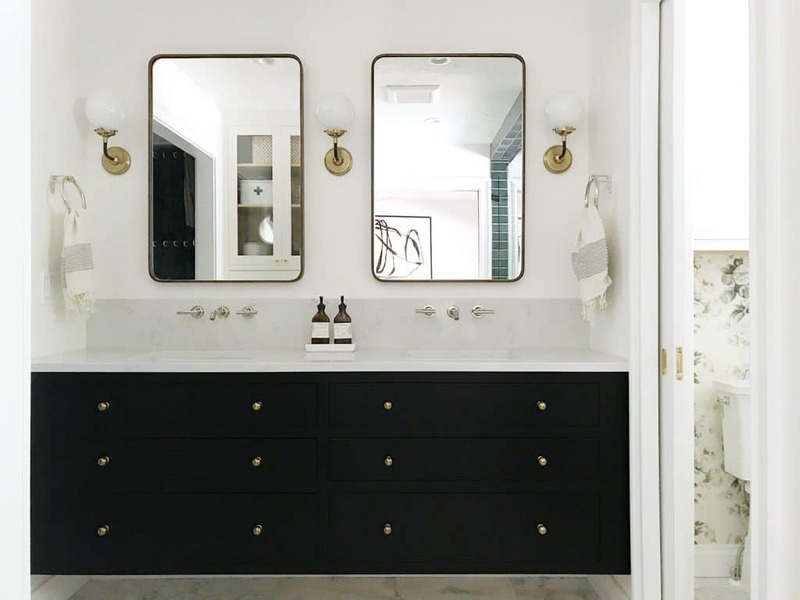 We mounted the vanity 9″ from the ground so the counter sits at 36″ high and it’s an actual joy getting ready with the double sinks and mirrors and all the storage in the drawers! Not to mention the ample lighting, both natural and the sconces we added. The undermount sinks paired with the wall-mounted faucets make cleaning the area a breeze. The dark green-ish tile from Fireclay Tile (Loch Ness is the color) really brought the drama to the shower area. We used 3×9 tile on the walls, niche, and ceiling and the Chain Homme pattern for the floor in the same color. Three shower heads feel like an absolute luxury. For day to day, Chris and I have our own sides that we use (and the thermostatic valve is always set to our temperature–so nice! ), but when I have a little more time, I turn them all on and it’s so completely relaxing, like a warm hug. 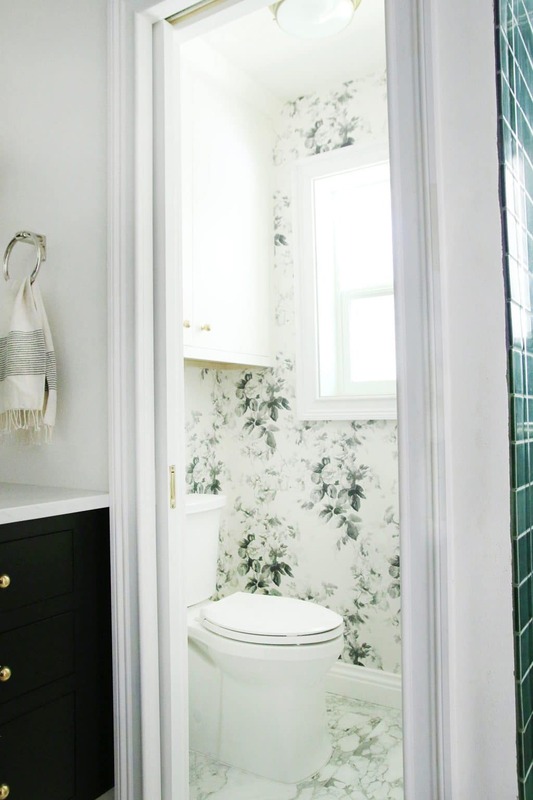 You can read more about our water closet here, but the splash of floral wallpaper feels unexpected and is a great juxtaposition with the more masculine shower. There was even room for a built-in linen cabinet! We designed it and had it custom made with the same company that did our vanity and water closet cabinet. It’t perfect for holding jewelry, medicine, cotton balls (etc), and we have towels and socks in the drawers! We’re so excited to share our closet transformation soon–it really is the icing on the cake! We haven’t missed the tub for a second (we do have one for the kids in their bathroom, but of course they want to use our shower now–haha! ), and definitely don’t miss this view. We’ll share a budget breakdown, as well as a FAQs soon, so if you have any questions, feel free to ask away in the comments! Thanks so much for following along in this fun renovation! « Have You Ever Been Part of a Progressive Dinner? Fabulous! While keeping an eye on my simmering “chicken breast” seitan I decided to use this time to search for ideal height(s) from the floor of what my partner + I are referring to as “mildly floating cabs”; your blog came up pretty high in the google search result and I am delighted both for myself to read this page (and a few of the others of your pre- bath remodel) and for you — what a fun transformation. I started planning + purchasing for this remodel nearly two years ago (Axor Softcube shower fittings were my first! ): creating a large, curbless shower in which we both (husband + I) can bathe our multiply, profoundly disabled youngest child was the impetus. Even with all the home mods we’ve now done it’s probably still less expensive for us to continue to remodel than to purchase anew … although I would LOVE to build a house from scratch for our family and our very particular needs, Needs, and wants. Of course. That being said, our ridiculously large master bath makes the most sense to house this new configuration. Well, if we were going to gut and move things around, I figured NOW. Now I can finally have enough storage to put everything away, including nothing on the countertops; Now I can finally have a bright, light, warm space; Now I can make my life easier in terms of a) finding things, and b) cleaning, and Now we can have a much safer, easier, and warmer space in which to bathe this most incredible child. Making things easier became my (new) mantra, so I decided to go ahead and make it my New Year’s Resolution for 2019: How can I make things easier for myself? And I try to do it. A few of my child’s medical professionals (with whom we are cosy + chatty) have since adopted it, and it makes me happy for all of us. So Thank You for sharing the height from the floor of your floating vanity. Thank You for sharing the dimensions of your wall mount faucet. (I’ve been dithering between the 7″ and 9″ lengths of the Graff ME wall mount two-hole faucet.) Thank You for validating my choice for doing a back-wall-only backsplash. Because of the appropriately strict (fed + state) regulations regarding significant home mods on behalf of people with profound disabilities, we will finally be able to start our project 1 May. The lead-up, planning, research has been so much fun and such an education. In my goldsmithing studio, aka a room in our basement where I also have my gently-used (!) exercise equipment, I’ve had plumbing, tile, mirrors, sinks, teak bench, custom light fixture stored in their boxes, just waiting. My rower is to the right of the pile, so I like looking to my left and daydreaming. Congratulations on your new bathroom. Am sure you are just loving it. Love your bathroom! It turned out so great. 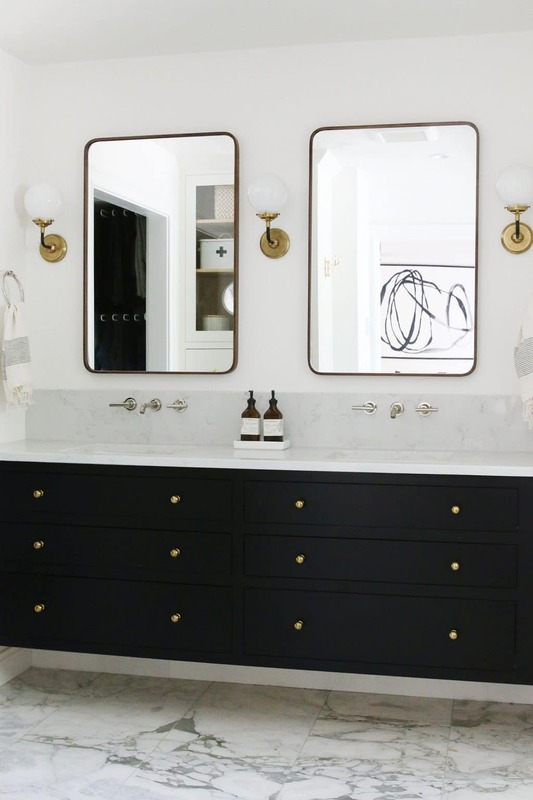 We are thinking of doing 2 sets of 36″ drawers for our master vanity. We have 79″ to play with, though. So I am curious about your spacing. What is the space to the left, in between, and to the right of the sinks? 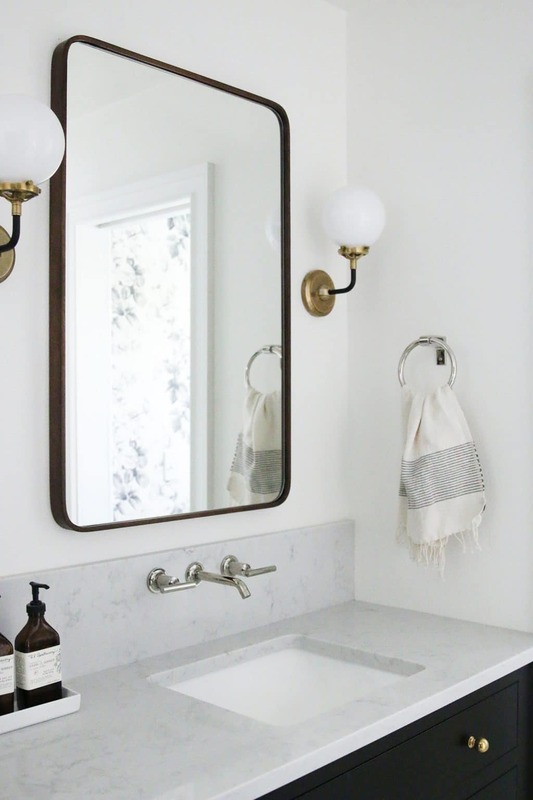 I want similar lights flanking the mirrors, so would love to know what you’re working with here spatially! 80″, so just about the same! 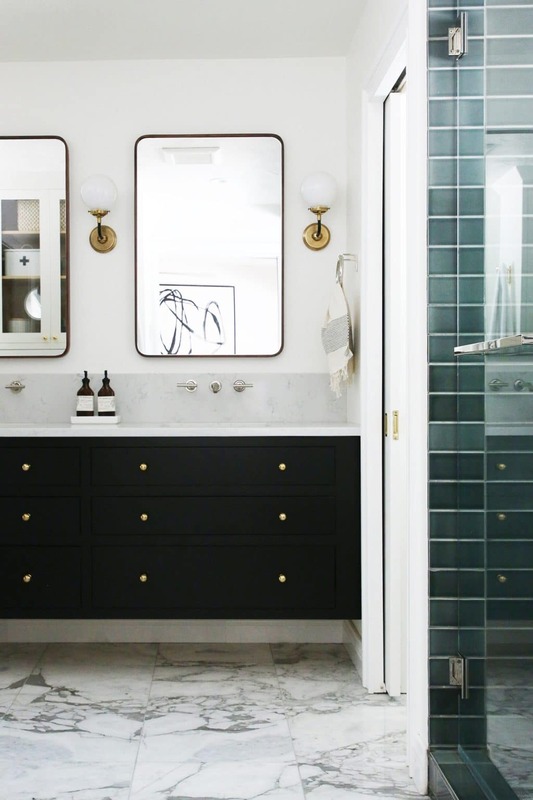 Love this bathroom and keep coming back for inspiration/sources. 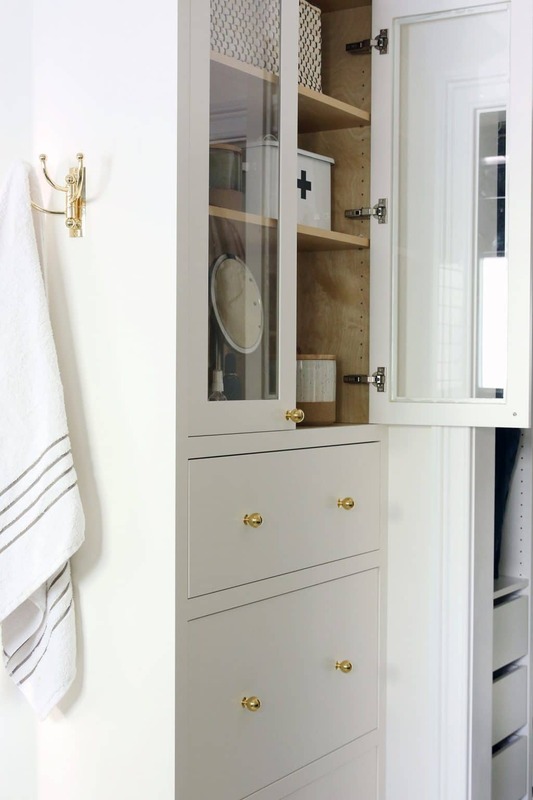 We’re about to put in a linen cabinet and give custom dimensions – your drawers look quite large/tall (which is great! ), what are the drawer heights? We have a tall space to work with so I’m curious how tall I can go without it looking odd. The drawers are about 15in tall. Hi Julia! What a beautiful bathroom! You did a great job. I am in the middle of doing a bathroom reno and I recently purchased the same wall faucet as you (Kohler Purist wall mounted – 9 inches). The faucet seems longer than it looks in your photos, just curious if you inset some of the faucet in the wall? Also, how deep is your vanity? We were thinking we may need to exchange it for the smaller wall faucet (I think there is a 6 inch option). Our vanity top is about 20in deep, and it’s inset only as deep as the backsplash – about an inch. Where did you get your bath towel hanging on the hook? Do you recommend them? I think they’re from Target! They do the job. What’s the source on the wallpaper in the water closet? There’s a link at the bottom of the post! 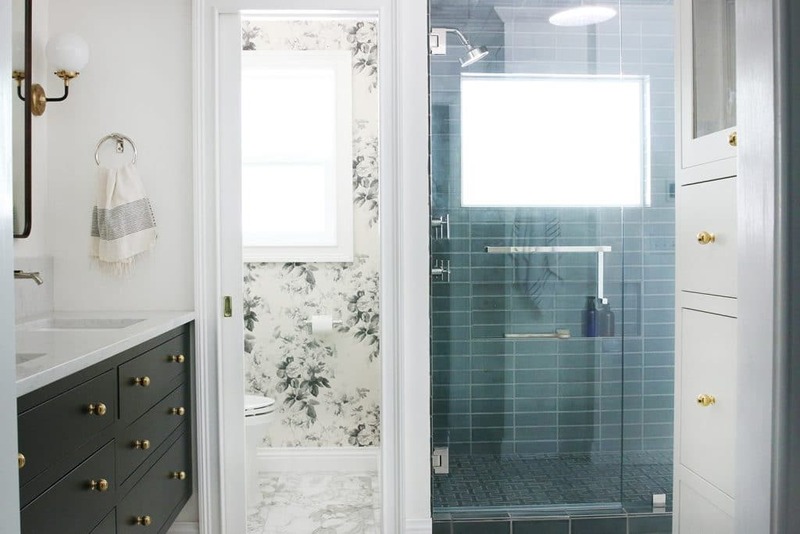 We recently updated a small bathroom and have the beautiful glass shower “walls,” too… what are your plans for keeping up with the water splotches/droplets that inevitably appear over time? Thanks again! 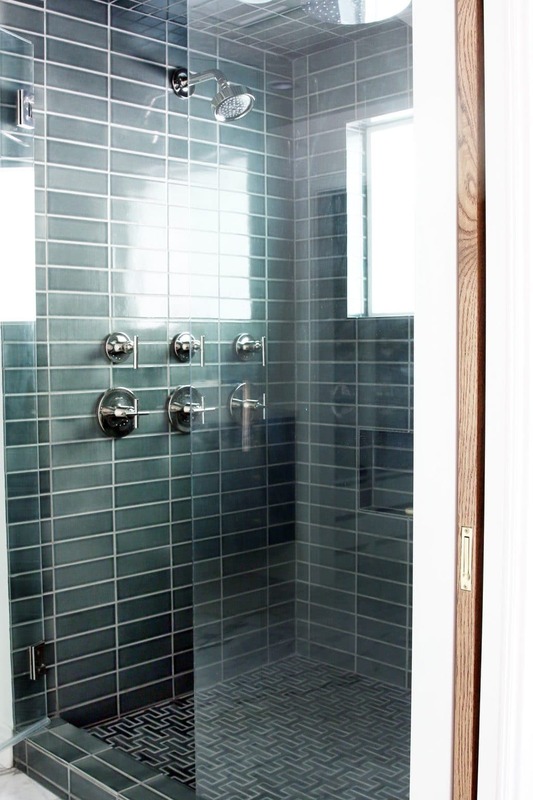 We use RainX Shower Door treatment and squeegee after each shower. We actually did a video about that on CLJTV on Instagram that you can see here. Cannot get over your gorgeous bathroom!!! Perfect! We are using the same sconces in our master bath renovation. I see they are 40 watt max. How is the amount of light they give off working for you? Is it plenty? And for makeup? I noticed you do have recessed too, how many please? What type of bulb in your recessed? Thank you so much, I so appreciate the info! The sconces (3) mixed with 3 recessed lights gives off plenty of light! This turned out SO great! Question for you…what kind of privacy glass did you use in your windows? Particularly the one in the water closet? They’re both the same and our contractor just had them made at the highest degree of obscurity available. Was there any discussion on how to lay the tile in the shower (brick vs the straight that you did)? It looks great….just was wondering how that was decided. Straight felt more fresh and a little unexpected to us. Nice quality, palette & materials…albeit a clash of too many juxtaposing/competing styles & fixture finishes. Glad you love it though as it would have cost a pretty penny! 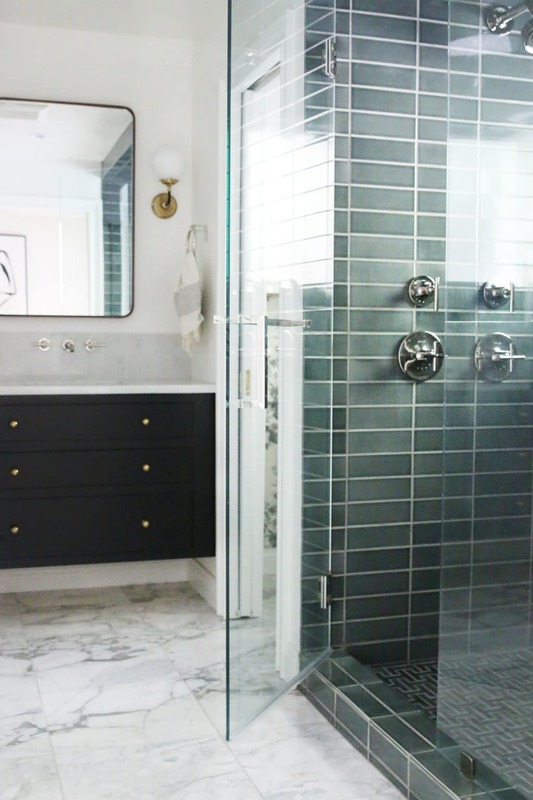 your bathroom is gorgeous! 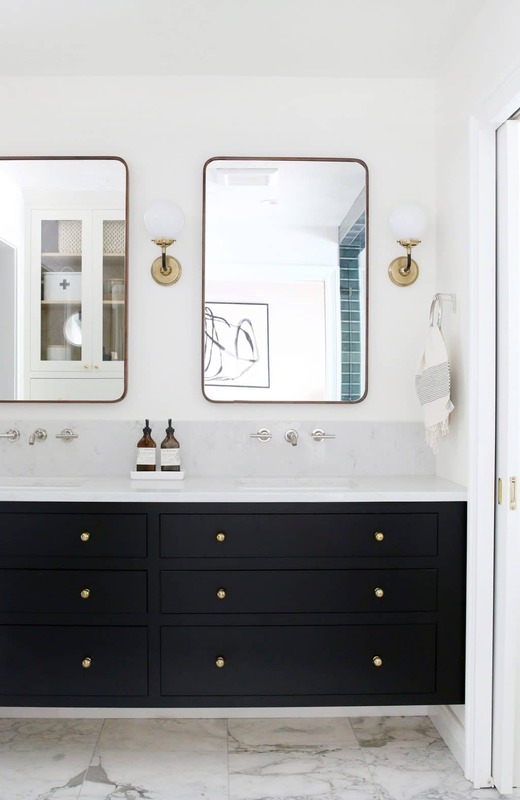 Where are the electrical outlets in the vanity area? I don’t see any on the walls. do you have electrical outlets in the drawers for your hairdryer, toothbrush, shaver, etc? We have two outlets in each of the top drawers and on the left wall there are two outlets behind the towel ring. Another stunning project! How are your outlets in the drawers wired so wires or cords don’t get pinched from the drawers opening and closing? We used a cord that is only just long enough for the drawer to be open, and it actually plugs in to the outlet in the wall and feeds to the outlet in the drawer. Love it all so much – seriously can’t pick what I like best. Everything works so well together and each piece individually is great. We are also doing a renovation and I’ve referred back to your blogs time and time again. What is the color of your linen cabinet? How about the dimensions? 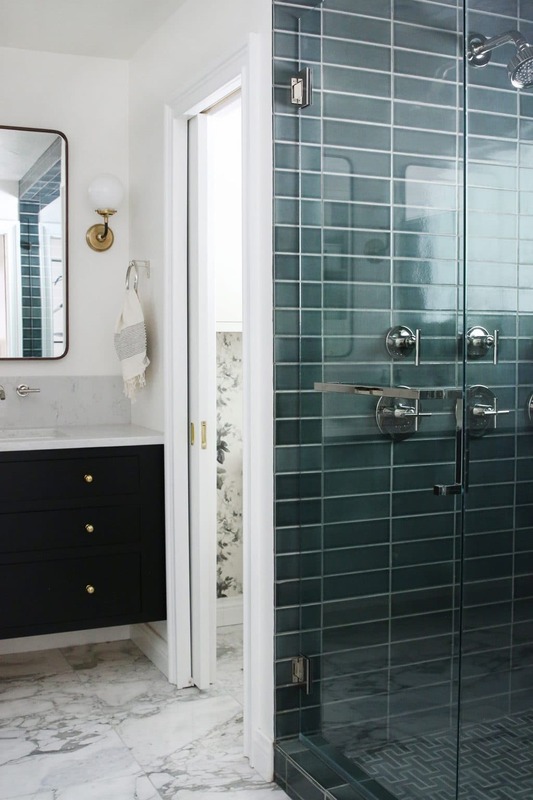 Love the shower tile! Am doing the same color in our master bath remodel!! One quick question- did you have any problems mounting the hand towel holder on the wall where the pocket door slides into? We want to replace our water closet door with a pocket door but the nagging question I have is “how will I mount a hand towel hook?”. No problems! You just need to keep track of where the supports are for the door and use shallow screws that won’t punch through. It is seriously so gorgeous! I don’t know what part is my favorite because it is such a showstopper. What color did you use on the linen cabinet? What are the measurements? White Flour by Sherwin Williams. Utterly gorgeous! I am dying….I am looking forward to budget breakdown, specifically cost of custom vanity. I would love to duplicate it! Great job, as always – congrats! Where is your shower door handle from? I am currently redoing our one full bathroom. 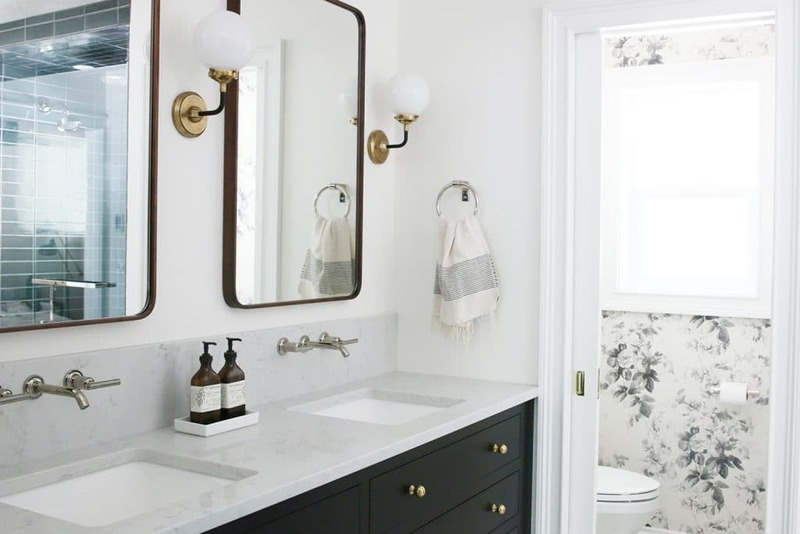 Your bathroom updates have been an inspiration! We ordered them through our glass door guy. Not sure what the brand, unfortunately, but we’ll try and find it! Yes! Love it so much. 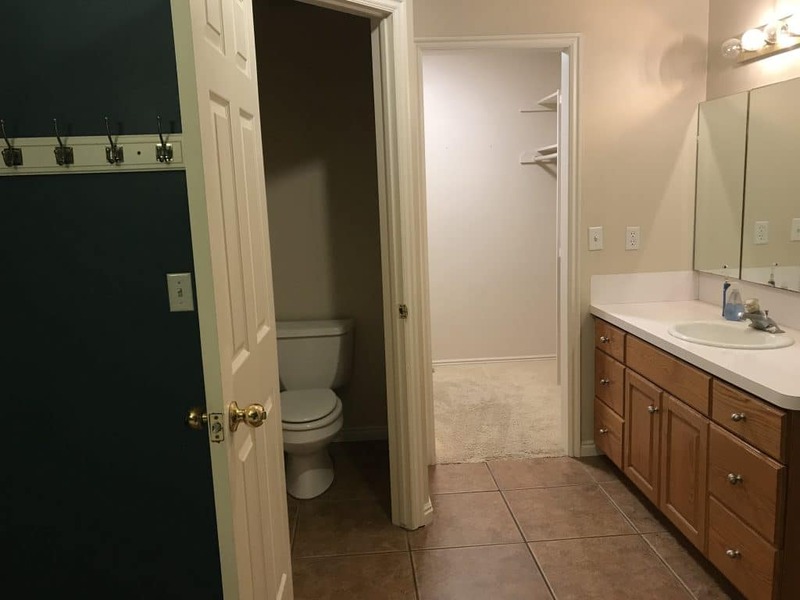 How much did it cost to move the toilet across the room? Our bathroom layout is the worst. Looks great! You guys have done an amazing job thinking through all the elements of the project. How is cleaning under the vanity? I’m currently planning two bathroom remodels. 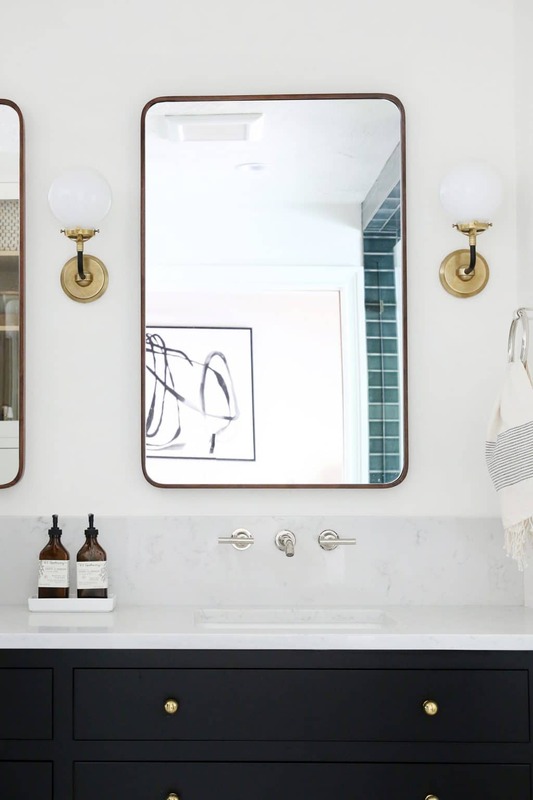 I love the look of a wall mounted vanity but I’m apprehensive to use it because I envision dust/dirt collecting under it. 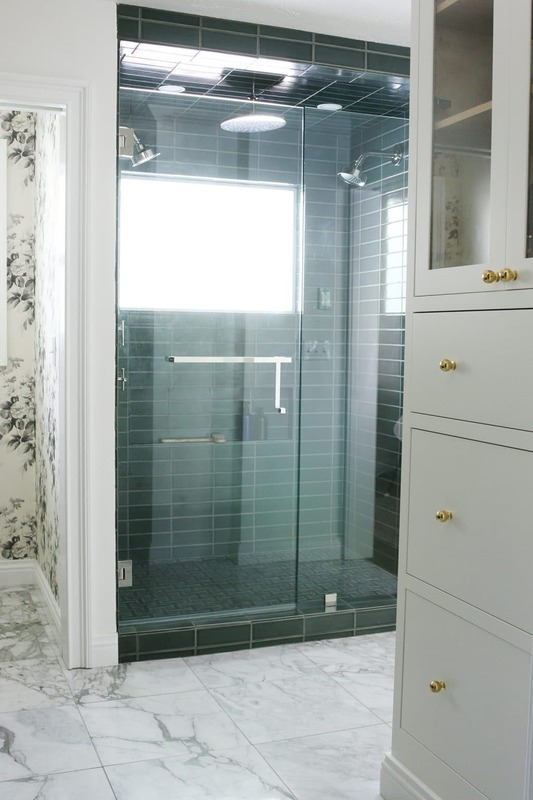 What kind of ventilation do you use to prevent the damage to finishes that can happen with shower steam? 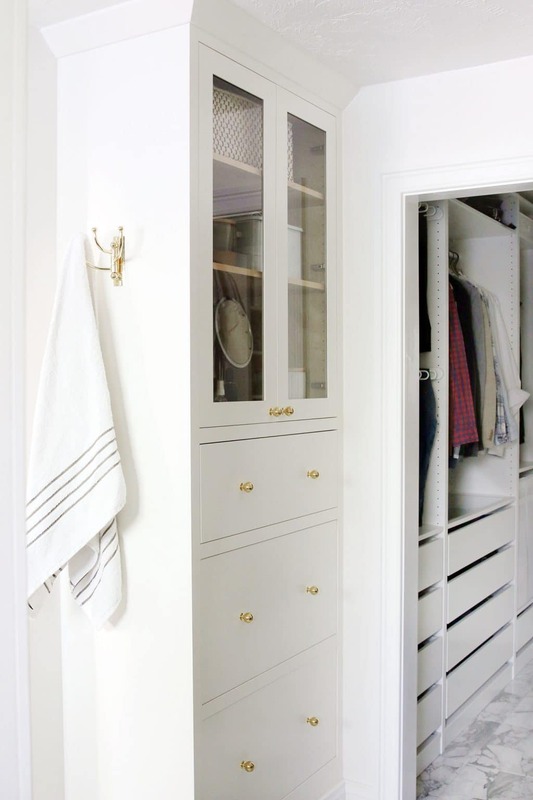 That linen closet with the glass front doors is SO amazing!!!! This turned out so beautifully! 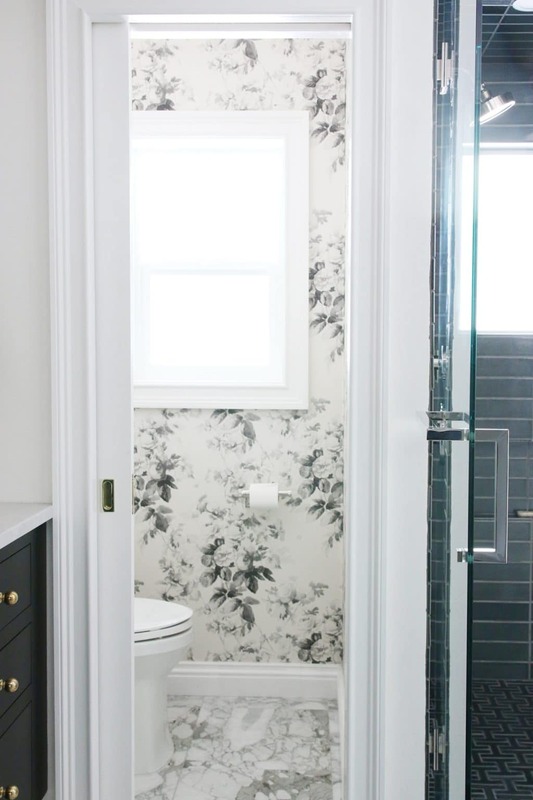 I especially love how the shower tile pairs with the peeks of the water closet wallpaper. It’s just perfect! Congratulations on a job well done! I love how your view into the bathroom highlights most of the special design elements… You can see the vanity, the floors, and that amazing shower tile all from that view. We recently designed a master suite addition to our house, and knowing that I’d have line-of-sight into the bathroom from “my side” of the bed, I was always thinking of what that view would be. That attention paid off for me, and it looks like it did for you too! Love how it turned out! It doesn’t get any better than this! Fabulous job! I totally second this request and have the same questions!! Amazing reno, absolutely love the colour scheme. We are thinking of changing our bathroom but yet to take the plunge. However we’re in a similar situation where we want to lose the bath and put in a shower instead though I’m hesitant to think about resale, what people prefer, etc. This will be our family home for at least the next 5+ years. We could potentially fit in both but given the space, the shower would be more ideal. We don’t have the luxury of putting a bath in another bathroom (it’s a 2 bed, one bath flat). What are the general consensus on having shower only homes? Did you guys worry about that at all or am I over thinking the whole thing! Guys, I’m so soooo happy for you! Congratulations on this beautiful bathroom! It’s easy to see how much love, thought and style (cozy-drama-luxury) went into this! 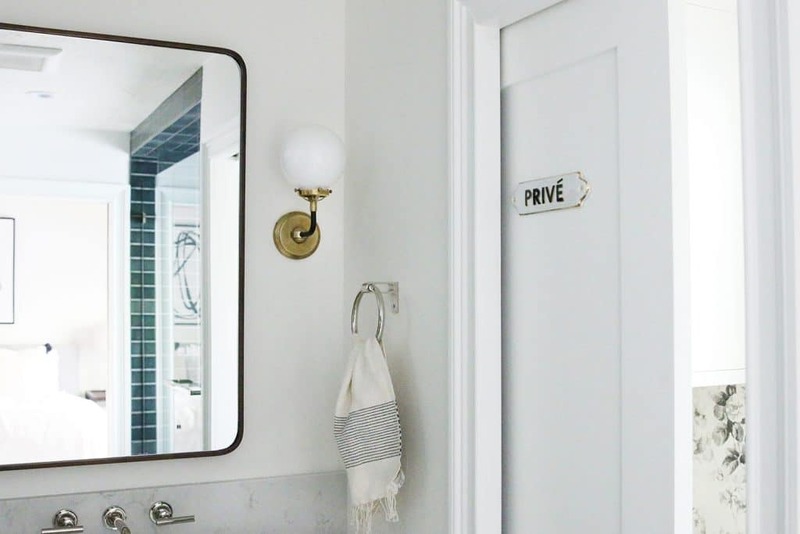 – where did you find that adorable “privé” door sign? – how did you decide where/how to include that linen closet? It’s BEAUTIFUL and so custom looking. BEAUTIFUL so custom looking. We are in the midst of designing a floorplan for our second home, and it’s details like this that aren’t “standard“ or “every day“, but rather are more custom and personalized, that I LOVE, but just can’t come up with on my own while drawing the floor plan. – did you do wall-mounted faucet to allow yourself more drawer space? 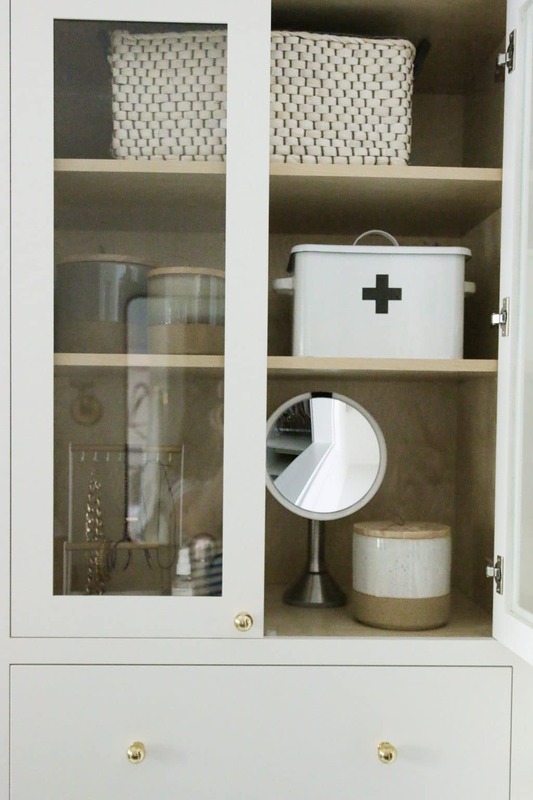 I love this look, and have contemplated it in the powder bath for looks, and maybe master to allow for more cupboard space, but I am so worried about plumbing repairs, and ripping the whole wall out. Hi Annie! I’m in commercial architecture, but love to assist friends and family with general planning of residential work like you mentioned. Those “something special” moments that you’re having trouble with are exactly what I crave to help people with!! Could I take a look free of charge? How can we exchange info? Definitely worth the wait! Its’ so beautiful…elegant, love the clean lines. I’m very impressed with your finishes and the overall style. You guys nailed it. I’ll bet you love going in there in the mornings! Did I miss the source for the shower doors? We went through a local glass company. Are all the windows frosted? Is that what you mean when you say “privacy window”? Is there a reason why you used an old school toilet as opposed to a modern wall hung toilet with hidden cystern? Wall hung toilet just wasn’t the right fit for us. We love the toilet we picked. 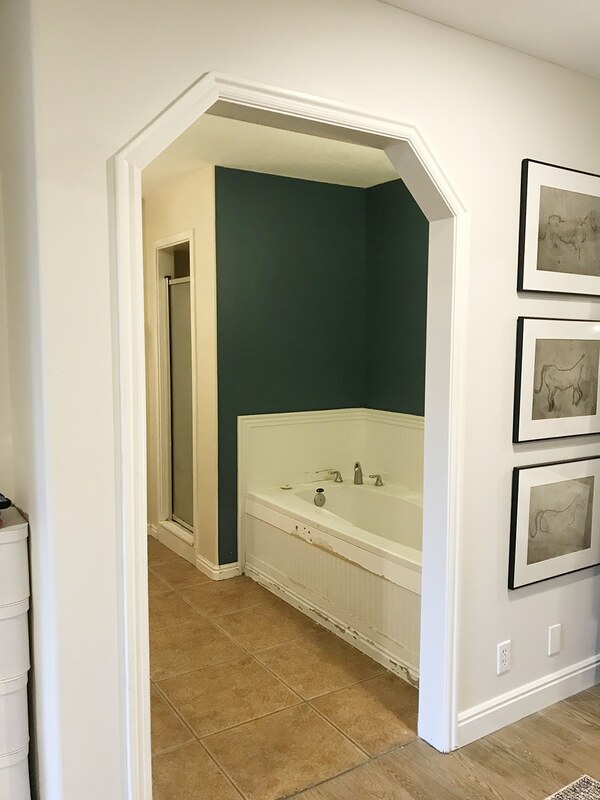 Did you take out the arch doorway from the bedroom to the bathroom? Is there a door there or it’s just open to the bedroom? It’s squared off now and there’s a pocket door! This is SO well designed! (And executed.) You had many brains both helping and complicating the process and after all those revisions and ponderings it came out A+++. Just dreamy! I have been waiting for this reveal and it did not disappoint! Where is the basket inside the linen closet from? I’m trying to remember! I feel like maybe container store? Love it. So exciting for you! I don’t know if I am missing it, but have you ever showed the transition between your two kinds of tile? Is there a threshold? I would love to see it. There’s actually no threshold! Our contractor matched the floor heights so there’s just a nice straight line. This must feel so amazing to hit “publish” on the reveal! I’ve loved following the journey- we can live vicariously through your beautiful new space! I don’t think I fully realized how rough looking the old bathroom was, staring right at you from your bedroom. Well done! Loooove the water closet wallpaper! Can’t get over how good it looks. I absolutely love this transformation! I think it’s fair to say your master bedroom and bathroom are my two favourite rooms in the house and I love how they play so nicely with one another! Such amazing inspiration for my future. House comes from you! All of your hard work designing and researching the heck out of this bathroom definitely paid off! I’m curious about the humidity in the closet given that your closet opens directly into the bathroom. Do you worry about your clothes getting musty or mildew-y? Our closet has always been open to our bathroom without any issue, except now we even have the option of opening a window or turning on the fan, so I’m confident we’ll be fine. I will say, we live in a dry climate–so that could add to it. I’m so curious about this too! Does it get steamy in your bedroom after someone takes a shower? My husband actually finishes getting ready in another bathroom after showering in the master since he hates the feeling of steam so much (granted this is post morning workout in humid east coast summers). No problems with that. The vent does a great job and we live in a really dry climate. Looks like it was totally worth the wait! Congrats, it’s absolutely stunning. And your sis did a great job on the photos! Gorgeous transformation! Thanks for sharing! In the mirror I see a reflection of a piece of black and white art. Is it “Knots” from Jenny’s Print Shop? 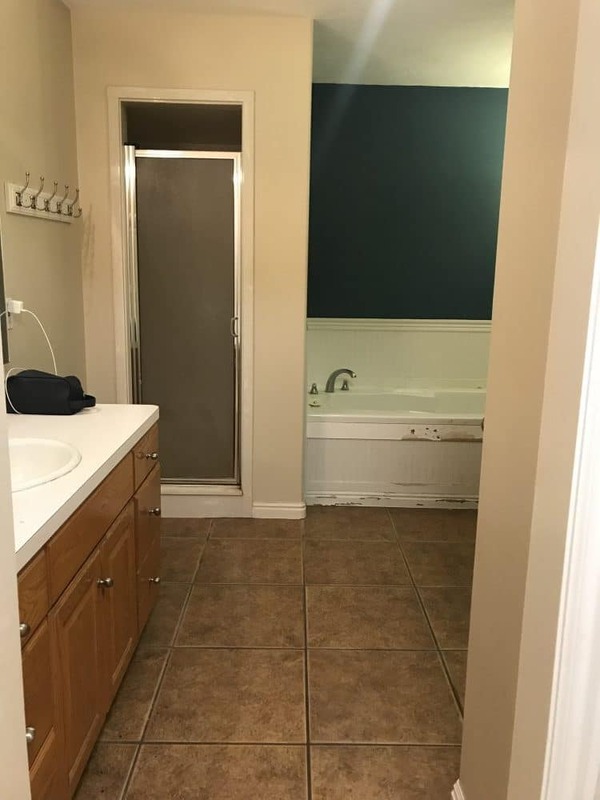 Is there an actual door leading into the bathroom or is it just open like the in the photos of the old bathroom? There’s a pocket door! Check out this post. Guuuuuuuuuhhhhhh that space is so gorgeous! What a luxury! I especially love that little Prive sign on the door. So cheeky and cute. It must feel weird to be done with your house. What’s next? Are you going to renovate the garage? We actually ARE working on the garage and our cabin is on deck! It looks absolutely perfect! I will be studying these photos for inspiration, as we are currently building a house. :) One question though – where do you keep a hamper? Love the after pics, you guys did such a great job! I’m curios about some of the practical uses, outside of the beautiful staged photos. Do you guys really just have two bottles in the shower? No his and hers shampoo and conditioner? No bathmat out of the shower? Will you add one? What about everyday towel use, I only see one towel hanging. Are you diligent about putting toothbrushes and makeup, etc. away? I would love to see drawer organization! Some of these answers are tricks of the camera and some of them are true and actual. I have a tray in my top drawer that holds my makeup and a tray for skincare as well. It makes it easy to just pull out the tray, do my morning/night routine and slide it back in. There’s also a spot for my toothbrush. Our countertop is always cleared just like this because we were 100% adamant about storage and we have MORE than enough now with a lot of empty drawers even. We currently don’t have a bathmat-but I would like one! I am just taking my time and finding the right one. Those are Chris’s shampoo and conditioner in the shower in the actual bottles he uses! My shampoo and conditioner aren’t as photogenic (let’s add my razor and body wash to that list) so I removed them as to not distract from the shower itself. Which is exactly the reason there is only one towel hanging on the hook–if there were more, you couldn’t see the hook! So for every day life, we usually have two towels on hooks and one hanging on the towel bar on the shower door. I’d love to do a post about our bathroom organization! We recently finished our master bath, and I too wasn’t thrilled with the mixed-up/various colored shampoo/conditioner bottles lined up – I bought clear bottles with black pumps from Amazon (used a sharpie to label the back with S: Shampoo, C: Condition, F: Face). Looks much nicer and worth the $20. I’d love to read the post about bathroom organization!! AMAZING!!! Love it! Can’t wait for your annual video home tour where you can finally really include this bathroom ha! 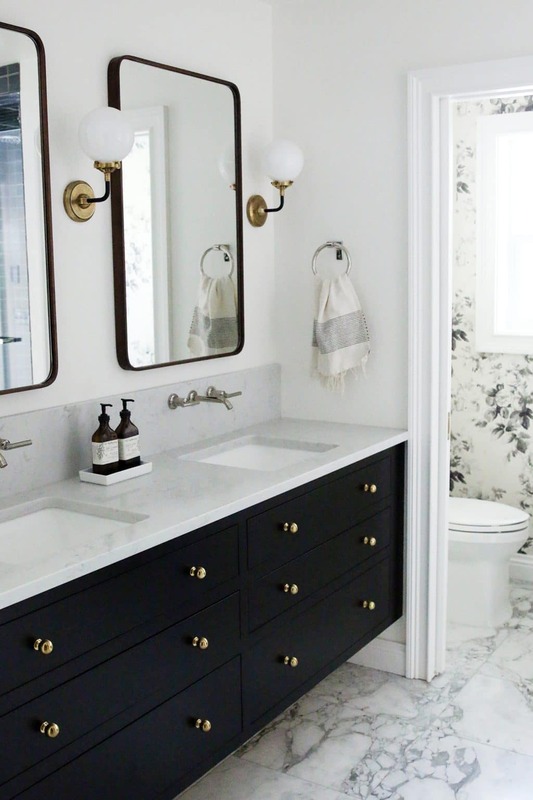 Is there any particular reason you guys decided against side splashes on the vanity? I just don’t love the look and since it’s an adult bathroom, there’s less of a risk of water splashing everywhere anyway. It looks so dreamy! Question about your shower tile – I see you didn’t use any bullnose, I’m hoping to do the same in my future bathroom reno starting in a few weeks. Can you tell me what you did instead for finish? These are called glazed edges and I love love LOVE the crisp, straight look. Should check it Schluter edge pieces as well – they’re fairly inexpensive and allow the tile to run all the way to the edge. I’ve now put them in my kitchen and bathroom so I didn’t have to end the pattern with a bullnose and still don’t have a raw edge. I love Schluter edges! Clean, modern and easy to install! Very beautiful! Your hard work and research really paid off. I’m really interested in the red plastic waterproofing that was applied before your tile. What is that called because for our next bathroom I want to make sure I have that step. I just redid my bathroom and didn’t use that. Beautifully done! Very elegant and stylish, contemporary yet timeless! 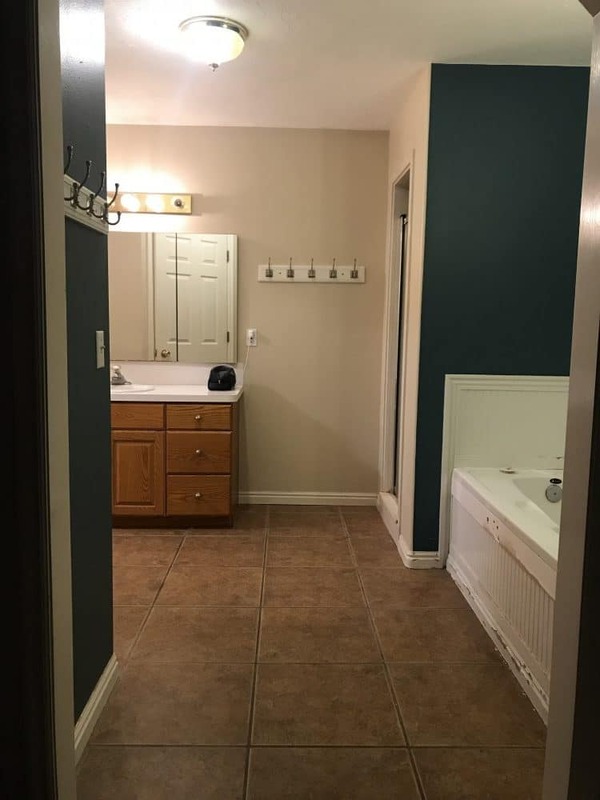 Good job and congratulations on your beautiful new bathroom!